This is the first in the Make a Plan Training series which talks about how to talk to clients about coming back for future sessions. 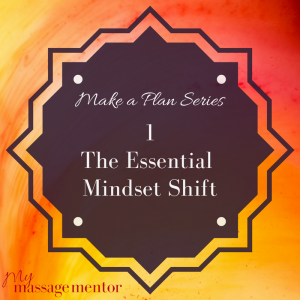 I created the Make a Plan Training for massage therapists at my clinic, because I found that it was the one thing that almost everyone really struggled with when they were starting out. People feel uncomfortable about talking to clients about rebooking because they’re afraid to sound like they’re being salesy or pushy, or they feel like people will think they’re just trying to get more money out of them – and obviously that’s not the case. We’ve all been trained that to make a lasting change in someone, especially if we’re working with a problem that’s been there for a while and it’s been building up over time, that they need to have more than one session. I remember when I first started out in a clinic and I would see clients and I knew that if someone came in with a chronic shoulder problem or chronic knee pain, they would need four to six sessions on a weekly or fortnightly basis to get rid of all the tension and to get them in a place where they could be pain-free for longer term. But even though I knew that, I still felt uncomfortable in how to talk to clients about coming back for a follow-up session and for a series of sessions. I’ve broken the Make a Plan training down so you can listen to it one step at a time. This first training is just a very simple mindset shift that you need to make when you think about talking to clients about coming back. Once you’ve made this mindset shift, everything else becomes a lot easier. It becomes a lot easier to start the conversation because in your head you feel more confident and comfortable with the whole process. In the reflective worksheet I ask you, when you start to talk to clients about coming back, how do you feel? If you feel uncomfortable, what are you uncomfortable about? What are you worried about? Are you afraid that you’re going to think you’re greedy? Or are you afraid that you’re going to sound pushy or that it’s just going to feel awkward? Now hold that thought in your head, and at the same time flip it around. I want you to imagine you’re a client but instead of going to your massage therapist, imagine that you’re going to a doctor’s office. Imagine that you have a problem, that you’ve got some symptoms and you don’t really know what’s wrong with you. The doctor says, okay based on your symptoms I think you probably have t his which means you’ll need to have these tests to check everything out and if we find this we might have to do this course of treatment. You know, maybe it’s something severe like you’ll need surgery and a series of rehab. I would assume in most cases you think the latter – health professional trying to help me. Now, a little bit more in line with massage. Imagine that you go to a personal trainer and you have a specific health goal. and how regularly they want to do it so you can give them advice to support their goals. In the reflective worksheet, look at how you feel when you’re talking to clients. Look at what comes up for you, why you feel uncomfortable if you are uncomfortable and tell yourself you’re a healthcare professional. Now to make this more permanent, this mindset shift, what I recommend you do is come up with a little mantra. A little sentence, or a couple of sentences that you repeat before each client. Or you have in your head, or maybe you have a little note on your desk, you know, when you do your consultations. So that you can start getting used to the idea that people have come to you not just for the massage, but also for your professional opinion. If you don’t give them that opinion in a way that is supportive and gives them space to be able to do what they need to do, then you’re actually doing them a disservice. In future trainings we’ll talk about how to bring it up in a session, what wording to use, when to do it – there is a formula that I have for that – but just initially work on this mindset shift in this subject and you’ll start to find this is a lot easier. Okay. Well, if you have any questions or if you’ve come up with any ah-ha’s or insights, I’d love to hear about them. We have a topic in the forum for you for the Make a Plan series so you can stick any questions or comments in there.